Studio Saizensens new fighting game, Blade Strangers, brings together a diverse and interesting mix of established characters in their own respective universes, but are new to the fighting game genre. Teaming up with publisher Nicalis has further bolstered the roster to include the protagonists from indie favourites Shovel Knight, Binding of Issac and Cave Story, as well as including the studio’s own Code of Princess heroine Solange and lead character from Super Famicom platformer, Umihara Kawase. So we caught up with president Toshinobu Kondo to discuss title leading up to its upcoming summer release. Nintendo Life: Hello, could you introduce yourself? Toshinobu Kondo: Nice to meet you, my name is Toshinobu Kondo, president of Studio Saizensen. I started making video games as a hobby when I was around 13 years old and I've been making games for 35 years now. My first job was as a video game graphic designer. Next, I became a manga artist and illustrator, and then we established a game company. That was 20 years ago. It seems like more than the average amount of backstory has gone into Blade Strangers. Could you outline the story for those new to the game? The world of Blade Strangers is actually a virtual world, part of a simulation of the entire universe. Our world is also one of the many virtual worlds, as are the game worlds that our favourite characters come from. And this virtual world is facing a great danger that threatens the survival of all the worlds. Only the strongest fighters can face that danger, which is why many heroes have gathered together in the virtual world - so they can become Blade Strangers and save the whole universe! We based the story on the theory that our current universe is actually simulated by a computer, speaking in terms of quantum mechanics. If that is really true, we can restore the world to a previous time or even make different routes, similar to the SVN (Apache Subversion) software that we use in game programming. Things like UMAs can be thought of as conflicts created by merging a different route. Are Akashic records really not the logs of the main server?! What is the difference between a perfectly simulated world and the real world? It was fun for us to think about these concepts, and they formed the basis of the game's main storyline. Was it difficult to balance the game for both newcomers and fighting game veterans? Balancing is a very difficult element when it comes to fighting games. 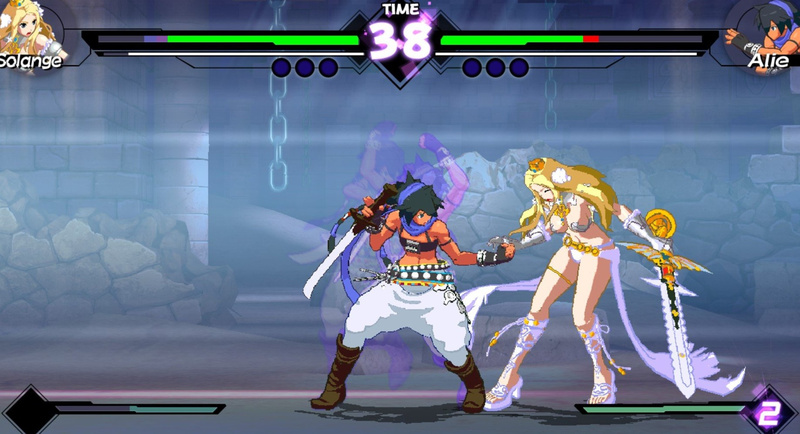 We progressed with adjustments that were based on having both novice players and veteran world-class professionals playtest Blade Strangers over and over. We put many hours into the playtesting and we’re confident that all players will be happy with the final balance at launch. How did the roster come together? We were originally making the game by ourselves, so at first, we were mainly looking at Studio Saizensen characters like Solange and Umihara Kawase. And then we had a wonderful encounter with Tyrone from Nicalis! He and I (and the team) discovered that we all had very similar thoughts and opinions regarding the direction of the game. So, whenever Nicalis would say, "How about adding THIS character?" everyone was totally up for it! Everything was decided very smoothly, and pretty soon we had 14 characters lined up, haha! How was the selection process of bringing in various Studio Saizensen characters, along with a few other Nicalis published games and even a surprise or two? Like I said, it happened very quickly. You'd think there would have been long, drawn-out debates and arguments about the character selection process. However, we found that everyone involved liked similar games, so by agreeing with each other's ideas, the line-up sort of evolved by itself! Is it difficult to introduce characters that weren't in a fighting game before or characters that might not be well known to players? I love all these characters, and the characters that you love should go above and beyond the game where they originally appeared; they should transcend genres. Therefore, it never bothered me that the characters came from different kinds of games. Of course, it's fun to include characters that are already known and loved by fans, but it’s even more fun to introduce characters to people who are unfamiliar with them and create new fans. That was very enjoyable; I never thought of it as a difficult thing to do. How does the range in the background of the characters affect their fighting style and move sets? That was one of the first things we needed to think about. We tried hard to include the skills that each character already had in the games where they previously appeared. Because of this, the characters' fighting styles and move sets were heavily influenced by their backgrounds. 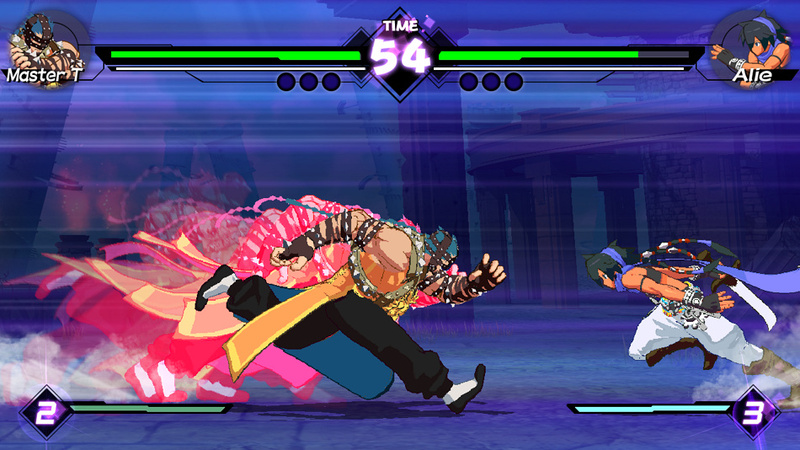 Blade Strangers is a mixture of ’old school’ and ’new school’. Can you elaborate for less seasoned fighting game players? Games that have been established in a genre can sometimes be a dead-end in terms of evolution, so it narrows down the user base and makes it harder for new players to join. 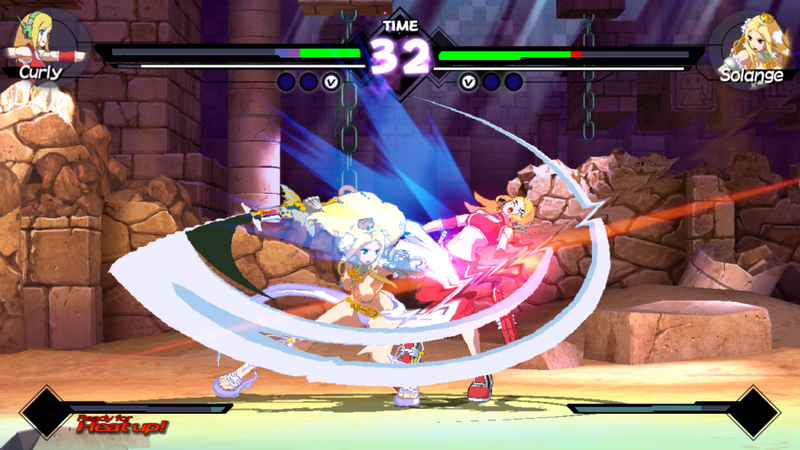 With Blade Strangers, we are trying to make a game that provides a new experience - to make good use of the more established elements, but evolve them to make it easier for new users to join in. Our goal is to create an enjoyable experience that both established fighting game players and new players can have fun with! The development system of transforming a 3D character models into 2D sprite work is an interesting choice. How did they become an option and what were the challenges? Studio Saizensen has been using and refining this style of development for more than ten years. So for us, the decision to go with this art style for Blade Strangers was an easy and natural one. 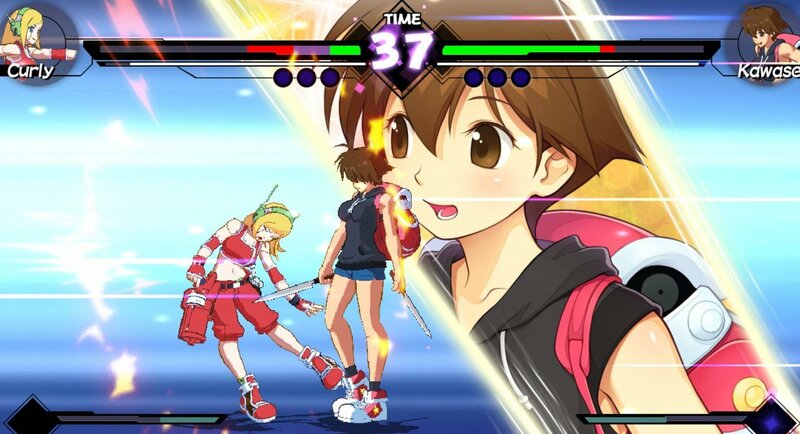 What are you hoping from Blade Strangers in terms of entering the competitive fighting game scene? Even players who have avoided fighting games up to this point should be able to compete well in Blade Strangers matches, because of the elegant controls. My wish is for the game to become a fighting game that many people can play, both casually and competitively. What do you think it can offer that differentiates itself from the institutions of the genre such as Street Fighter or Tekken? Probably the biggest difference is that the characters in Blade Strangers can be freely used with simple controls; players aren't required to memorize complex button inputs. Also, players can become familiar with many characters that nobody would've expected to see in a fighting game. We want to provide our players with the fun of simple controls that feel good, along with the freedom to choose the character of their liking. And to top it off, if players are then able to hone their skills and discover the depth of the fighting game that lies beyond the simplicity, that would make us extremely happy too. Are there any Switch specific features or is there any exclusive content at launch/in the future? The great thing about the Switch hardware is the ability to take it with you wherever you go and challenge other players on the go. Aside from that inherent hardware benefit, there are no platform-exclusive features that we’ve announced. Publisher Nicalis has done a great job of including extra content with physical editions of Switch games. Can you reveal any information about what's coming with the physical edition? You’ll have to ask Nicalis about this, but I’m sure they’ll have some announcements coming soon. 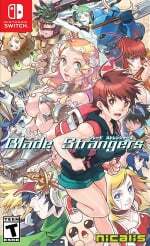 What other media would you like to see the Blade Strangers universe in? To tell you the truth, I really want to see the different types of fan art that this game will inspire. Next, I'd love to see anime. So the story is that it's a Git repository gone awry? That's novel if nothing else I guess. Absolutely on my radar this one. Will hang on for physical as I think it could become quite the collectors item. Hoping it has strong reviews and sells well but this has 'cult'/collector's item written all over it. As long as it plays competently the quirkiness and crossover appeal make it an almost definite buy for me. Hurry up and bring it out. Have been waiting for about a year now for this. Animu shovel knight and Isaac. I hope the music isn’t only (what sounds like) Japanese death metal. Those trailers all have that grating, incessant guitar riff. It may sound petty, but that’ll actually keep me from buying the game. Pre-ordered about a year ago, I cannot wait for this. Everything about this feels fresh and exciting to me, looks like really good fun. Love the frequent new character videos that have been steadily released. @Gen0neD Ha, I don't think you know what Death Metal is. Also, it's in English, not Japanese. yeaaaaaahhh... this game needs to release, already.... and also, hopefully Shantae will be part of the roster (either at release or future DLC). The theme tune is as bad as a crappy 80s cartoon. So obviously totally sold on this. @Sakura7 I think the Royal Space Force avatar speaks for its self. 2D fighters are my jam. So very much looking forward to this and Blazeblue. Playing 3rd strike till my fingers fall off. If it comes to Europe physically, I'll buy it in a heartbeat. @GrailUK I learned my lesson from USFII. I play fighters too much to have to switch out carts. So I preordered the digital version. yeah it costs more but I got the gold coins and I can play SF instantly. So worth the cost to me. @Bod2019 Gotta love it when they make all the female characters wear "battle armor" that is basically just metal underwear. I'm interested, depending on how the game shapes up. What you say is probably true. Music is still terrible though. I’m gonna stand by that. Just put Shantae as DLC and I'm DOOOOOOOOOOOOOOOWN! Looking forward to this. I already know I'm going to main Solange.